Photo of Al-Jura, ethnically cleansed and "mostly destroyed" by immigrant Jews in 1948. They left a "single house" standing. Every US politician makes the obligatory trip to Sderot, an Israeli town built on the defaced and ethnically cleansed Palestinian Village, Najd. I wrote previously about Najd, "Sderot Built on Ashes of Ethnically Cleansed and Defaced Najd." Astute politicians, albeit unconcerned about getting re-elected, might find my article about the history of what is now called Sderot, and might also find interesting the history of what is now called Ashkelon, which is built on ethnically cleansed and destroyed Al-Jura. Because the root of the problem between the Jewish immigrants who came to Palestine from all over the world and ethnically cleansed the Palestinians and then destroyed over five hundred of their villages and the Palestinians is that the initial injustice to the Palestinian people, is not addressed and most of the time not put into context for people not familiar with the history of Palestine. I wish that every Palestinian-American and others concerned about justice for the Palestinians would flood the newspapers and media with letters and comments about the relatively recent history of the area. 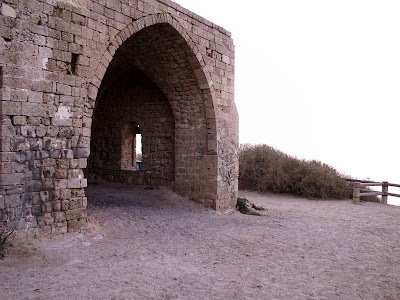 Consider what is now called Ashkelon, which is an Israeli town built on the ruins of Al-Jura. We learn from Palestine Remembered that just 21,972 days ago its Arabic name was Al-Jura. Walid Khalidi reports in All That Remains: The Palestinian Villages Occupied and Depopulated by Israel in 1948, that Israeli "bombing and strafing left its mark on the population in the region which was psychologically unprepared and had no access to air-raid shelters." He quotes a United Press International report which cites an Israeli intelligence officer that "Israeli military activity in the coastal areas had caused 'despair among the local inhabitants'" (82). Probably similar to the despair which the still living inhabitants of Al-Jura and other Palestinian villages ethnically cleansed by Israel are experiencing today in Gaza. Zionists have a long history of destroying every aspect of Palestinian life. Consider that 21,972 days ago, before Al-Jura was ethnically cleansed and destroyed, Palestinian Arabs owned 12,015 dunums of Al-Jura and Jews owned none (117). Al-Jura was a summer resort for their likewise ethnically cleansed neighbors of Al-Majdal (116). Khalidi reports "An annual spring mawasim (a season of celebration) was held in it, to which people in the cities and villages of Gaza District flocked for swimming, sports events, and religious festivals. A market was organized specially for the occasion where visitors could shop (116). We also learn that "fishing and bird-hunting were the villagers' main occupationss, and their fish and game were sold in several neighboring towns and villages. (In fact, the village was one of the main fishing centers in Palestine.)(116). Consider Al-Jura, whose inhabitants currently live in Gaza, some of whom fire rockets on Ashkelon, which sits atop its remains. Consider more than 400 other Palestinian villages that were destroyed or depopulated by Zionists in 1948. Consider that Israel denies the fundamental right of return home for these people who just 21,972 days ago were bird hunting, fishing, and hosting summer festivals in their villages. Al-Jura is a microcosm of the damage Zionism has inflicted on Palestinian life.